If you want to enhance your home’s curb appeal, choose LED outdoor lighting. LEDs offer numerous benefits, efficiency being one of them. These light bulbs can last up to 50 times longer compared to filament bulbs yet consume up to 90 percent less energy. They are ideal for high or difficult to reach places as they can burn for up to ten years before a replacement is needed. LEDs also offer intense brightness with very little heat emission and no flicker, which makes them a much safer outdoor lighting option. Floodlight bulbs provide a wider range of lighting. They are great for outdoor use when light needs to be spread over a larger area. Security lights often utilize floodlight bulbs to illuminate a porch or garden from a single source. Spotlight bulbs are generally used in tracked or recessed lighting because they are much smaller. They are commonly installed with directional heads which makes them perfect for highlighting a specific area. Candle bulbs are the most decorative among LED lights. They offer a more conventional spread of light which mimics a candle flame. A-Line bulbs provide a wide angle of illumination that can spread light across a larger area. They have the same range as floodlights but they offer more horizontal lighting which is ideal for paths and long driveways. Steel is commonly used in light fixtures, including outdoor LED lights. Stainless steel results to a clean and modern appearance. Paint pressed steel, with its ability to accept any color, is very customizable which makes it the perfect material for a changing décor. Plastic is vulnerable to heat and this is why it is rarely used in conventional lighting fixtures. However, since LED bulbs emit less heat, using this material has become possible. Plastic’s malleability and ability to be dyed makes it a great choice for custom fixtures. Aluminum can be said to be the perfect partner for LED lights. This material blends quite well with the modern white glow from outdoor LED lights. It also complements the low maintenance feature of LEDs, with its rust proof and durable properties. Brass is a traditional material for light fixtures, largely handmade to this day. This material’s rustic appearance is able to soften the strong artificial light of produced by LED bulbs. Although brass outdoor light fixtures are a bit expensive, they are a great long term investment. One of the most costly metals to craft from, copper is practically universally handmade and ages impressively well. The green finish that copper takes on is very popular because of its appealing look. Cooper is also resistant to all forms of corrosion, complementing the low maintenance LED technology. 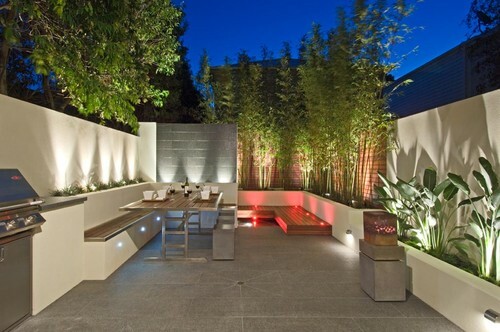 Fixed outdoor LED light fixtures are semi-permanently attached to walls or ceilings. This type of light fixture is often featured in open porches and side passages where it can be easily protected from the elements. 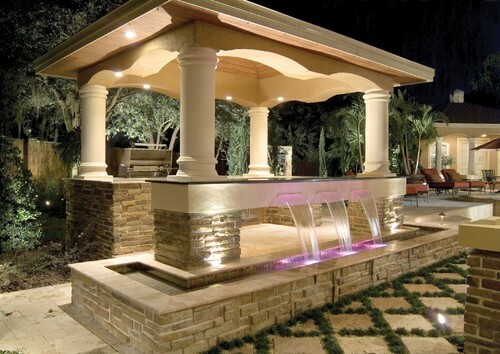 Hanging outdoor light fixtures provide a traditional appearance that offsets the artificial glow of LEDs. Since LEDs rarely burn out so frequent replacement is not expected, lanterns and oil lamps can be hung from high areas. Standing outdoor LED light fixtures are usually mounted onto bollards on driveways or posts, reminiscent of old Victorian lamp posts. Since LEDs are relatively much smaller than filament bulbs, they make the perfect option for outdoor recessed lighting. They are also lower maintenance and do not require frequent replacements which is why they are the best lighting to be mounted flush on surfaces that are harder to access.